Munchery Review: The Best Highest Quality Pre-Prepared Meal Kit? Started in 2010, Munchery’s mission is to make healthy eating both fast and delicious. 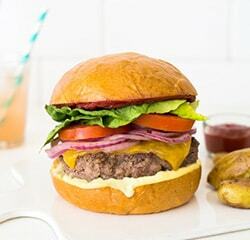 Instead of hitting the drive-thru, you can order pre-made meals from Munchery’s team of chefs, which only need to be heated up. Or if you’d like to cook something yourself, you can get one of their cooking kits, which provides you with ingredients and instructions to bring your meal to life. Plus, they even provide same-day delivery in some areas, which allows you to have fresh meals prepared by local chefs in your area. That’s something that most meal delivery services don’t provide! No matter how you choose to use Munchery, you can always count on receiving great meals with fresh, quality ingredients. That’s what really matters! To learn more, keep reading for how you can sign-up and what kind of meals you can expect to see on the menu. Ready to place your first Munchery order? If so, it couldn’t be easier to get started! First, you’ll begin by submitting your email address and your zip code. Your zip code is necessary to ensure you are within Munchery’s service area, otherwise you wouldn’t be able to receive a delivery from them. Currently, they offer their meal delivery service to over 1,000 cities all across the United States. After you’ve input your information, you’ll be prompted to order prepared meals that have been created by their team of chefs. This is your opportunity to begin building your box, as you’ll need to select the meals you’d like to receive in your first order. First, you’ll need to select your meal count. You can choose to receive either four meals per week or six meals per week. Each meal contains one serving, so you’ll want to keep that in mind when choosing how many you’d like to receive. You’ll also have the ability to choose your delivery day based on what’s available for your location. When you make your choice, Munchery will show you which day your first delivery will be on. Then, it’s time to start filling your box with meals. Munchery will present you with a list of available meals for the week. Depending on how many meals you chose to receive, you’ll be able to pick either four or six items. After that, you’ll move onto the checkout process and then you’ll simply have to wait for your order of delicious food to arrive. 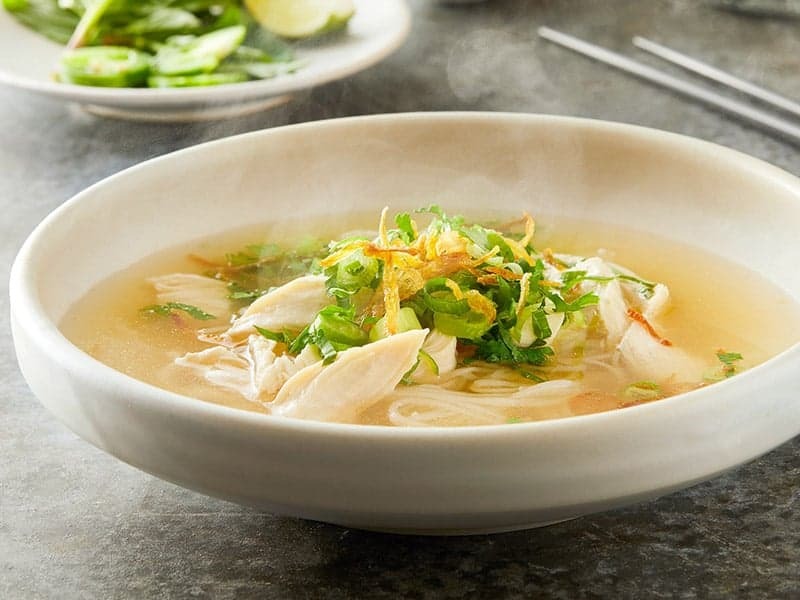 One thing that’s important to Munchery is providing customers with quality, delicious meals that are quick and easy, while still being healthy. After all, you shouldn’t have to sacrifice nutrition in favor of a fast meal. 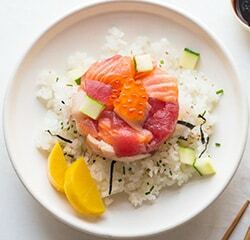 There’s a team of real chefs behind Munchery’s weekly menu, plus they only use some of the best ingredients to ensure everything is fresh and flavorful. You’ll never feel guilty about eating any of their tasty dishes when you know just how packed with nutrition they are. You’ll find a variety of creative dishes on their menu each week, which are sure to get you out of that food rut you’ve been stuck in. 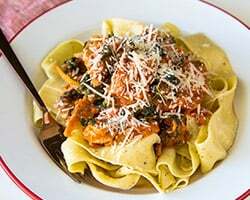 A few of the dishes you’ll find include: Murray’s Farms Chicken Ragu with Pappardelle, Castle Valley Burrata with Crispy Polenta, Grilled Salmon with Aioli, and Murray’s Farms Roasted Chicken & Bacon-Brussels. You may even find the Black Angus Argentinian Grilled Steak, Satur Farms Salmon & Quinoa Tabbouleh Bowl, or the Tom Cat Bakery Basil Chicken with Panzanella on the menu. Before you get started with Munchery, you’ll want to first make sure that you live within their delivery area. You can determine this by checking out the service areas listing on their website. Alternatively, you will be notified if you are unable to receive deliveries when you submit your zip code on their website. If you are within their service area, you’re good to go! There are two different options for delivery with your order. Depending on where you’re located, you may be eligible to receive same-day delivery, which means your order will be dropped off by one of the Munchery drivers. This is incredibly convenient for those times when you place a last minute order. For those that do not live within a same-day delivery area, you will have to go for their “Plaid Box” delivery option. You will be able to track your order as it makes its way to your home. To do this, there is a “Track Your Delivery” button when you log into your account. This will provide you with a map of your delivery, plus your driver’s location. You can also use the Munchery iOS or Android app to view tracking information. One important thing worth noting is that you do not have to be home during the time of delivery. This means you don’t have to worry about waiting around for your order to be dropped off. You can go on about your day as normal without any concerns of not receiving your package. However, if you know you won’t be home during the delivery time, Munchery asks that you provide them with consent to leave your package. You can include delivery instructions on your order during the checkout process. If you won’t be home, you may also leave a cooler outside for your box to be placed in. You’ll just want to make sure you specify in your delivery instructions that you would like it to be placed in the cooler. 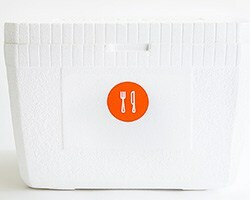 Each of the meals you receive will be packed inside a chilled box. This will keep everything cold and ensure it’s safe for consumption when it arrives on your doorstep. To do this, Munchery strategically packs up their boxes to prevent the meals from dropping below the optimal temperature. When shipping their cooking kits, the box is packed with non-toxic, water-soluble frozen gel packs. These will keep your food nice and cool as it makes its way to you. After you’ve unpacked your box, you can keep these in your freeze and reuse them again and again in the future, which really comes in handy. Munchery also uses recyclable insulation within the box so you never have to worry about something spoiling. Everything is then packed into a specially-designed container. All of your food will be fresh and chilled upon arrival. As mentioned previously, you can leave a cooler outside if you know you won’t be home to receive the delivery. Although you shouldn’t have anything to worry about, leaving a cooler for storage should ease any worries and help protect the food a little longer. You can, however, typically count on deliveries to be made by dinnertime, which is around 6:30 PM. Sometimes deliveries will take longer than that, so you just need to be on the lookout. Once you receive your delivery, you’ll want to unpack it as soon as possible and place all of your items in the refrigerator right away. You don’t want to leave anything out longer than you have to. Munchery also prides themselves on using eco-friendly materials for their packaging, many of which can be recycled. Their cooking kit box is 100% recyclable. All you have to do is break it down and then add it to your curbside bin or take it to a local recycling facility. The prepared meal trays are made from renewable plant fiber and are 100% compostable and biodegradable. The sleeves are made from 100% recycled paperboard. Because there aren’t any adhesives, PVC papers, or contaminants in their liner/insulation, this can be recycled as well. You’ll just need to find a local recycling facility that accepts PET #1. The ingredient bags can be taken to a facility that accepts #4 plastic. Deli-style containers that you receive can be reused or recycled. And the recipe cards are compostable and recyclable. The gel ice packs are reusable if you’d like to keep them, but they can be disposed of if you’d prefer. If you’d rather get rid of them, use scissors to cut the corner of the ice pack. Then, discard the gel in the trash can instead of the sink drain and recycle the plastic pouch. This plastic pouch is accepted at any location that takes #4 plastic. Munchery takes great pride in sourcing quality ingredients for each one of their meals. They’ve partnered with many local farmers who specialize in seasonal, all-natural, and organic produce. Those farms also offer antibiotic-free meats, and use wild-caught fish when possible. For any meals that contain grass-fed, organic, or free-range ingredients, they will present that information on their menu so you always know what you’re getting. There are no questionable ingredients when ordering their meals. You can always feel confident that you’re getting the best. Plus, higher-quality ingredients mean these meals are better for you and packed with nutrients, plus they’ll be much more flavorful. That’s always a bonus! For the best experience with your food, Munchery recommends to consume prepared meals within two days of delivery. For cooking kits, they suggest cooking those within three to four days of delivery. If you receive any meal that contains fish or seafood, they advise eating that the day of delivery. If you choose to receive freshly prepared and chilled meals from Munchery, you’ll simply need to heat up your food before eating. Each meal comes with heating instructions for your microwave or oven, which are very easy to follow. Heating up these meals typically doesn’t take any longer than 10 to 15 minutes in the microwave or oven, so you won’t have long to wait before dinner is on the table. You may also have the ability to order the Munchery cooking kits, which will require just a little more effort on your part. Instead of simply reheating a dish, you’ll actually get into the kitchen to do some cooking. Munchery will do all the grocery shopping and prep for you and delivery pre-portioned ingredients that you need for your meal. Then, you’ll follow the included recipe card to whip up your dish. This recipe card also includes any cookware or extra ingredients you’ll need, which should be staples in your kitchen. Even though you prepare these meals, they typically only take between 15 and 20 minutes to prepare, which isn’t bad at all. With so many high-quality and delicious dishes to choose from, you really can’t go wrong when making your weekly meal choices. One dish that’s certainly a favorite is the Apple Glazed Pork Chop with Spiced Apple Sauce, Mashed Potatoes, and Savoy cabbage. The antibiotic-free pork chop was flavorful and tender. The apple cider glaze complements it perfectly and the side dishes provide the perfect addition to the dish. For the steak lovers, you’ll appreciate the Black Angus Argentinian Grilled Steak with Papas Bravas, Green Beans, and Salsa Criolla. 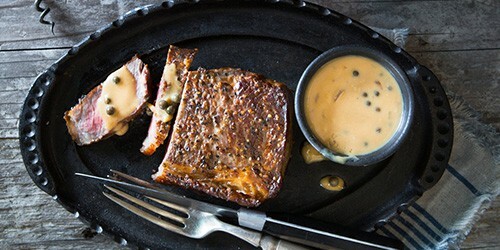 This juicy cut of steak has been seasoned with a blend of brown sugar and chili spice, making it incredibly flavorful. You’ll also receive two sauces, which includes the salsa criolla to drizzle over your steak and a garlic aioli for dipping your potatoes in. If you’re in need of some delicious comfort food, you really can’t go wrong with Munchery’s Baked Ziti. It contains tomato sauce plenty of mozzarella cheese, provolone, Bechamel, and even a side of garlic bread. Since it’s made without meat, it’s totally vegetarian-friendly but it’ll still satisfy any pasta cravings you’ve been having. It really doesn’t get any better than that! Now, let’s talk about how munch a Munchery subscription is going to cost you. As mentioned previously, there are two different options you can choose from for a weekly subscription. You can opt to receive four meals or six meals. Each meal serves just one person. If you’d like to receive four meals, you’re looking at a cost of $14.49 per serving. An order of six meals will cost $12.99 per serving. Shipping is free for these orders. However, if you are doing a same-day delivery with a Munchery driver, there will be an additional fee because they have to get paid too! If at any time you’d like to change your subscription, you can do so by logging into your account. You can always downgrade or upgrade if you feel you need to. When ordering from Munchery, you don’t have to choose between healthy or delicious. You can have both thanks to the meals that their award-winning chefs have crafted, plus the use of farm fresh ingredients that are good for you. Eating well has never been easier, thanks to the options they’ve provided for their customers. Whether you choose to receive pre-made meals or one of their cooking kits, Munchery has you covered. Putting dinner on the table every night no longer has to be something that stresses you out when the meal planning and grocery shopping are taken care of for you.